We all know what a fruit tree looks like. An apple tree bears apples, and orange tree -oranges, and if you saw a fake tree with plastic fruit on it, you could tell close up it was fake, but from a distance it may look good. The closer you get to people, the more you find out about them and you can see their fruit more clearly. We need the genuine love, joy, peace, patience, kindness, goodness, faithfulness, gentleness and self control of our Lord and friend. So, the closer we grow to Him, the better our fruit will be. All is about walking with Jesus with the help of the Holy Spirit. 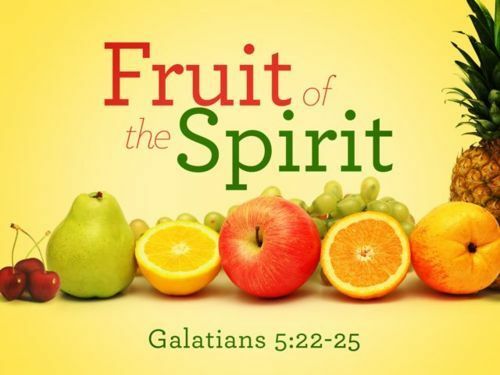 Galations 5:16, 18, 25 tells us to live by the Spirit. We can walk with Jesus just as surely as the two disciples did. Walking with the Spirit helps us to lose our desire of the sinful nature, it will help us to not produce bad fruit as listed in this passage. Go have a read of that list. It’s great to not just read what we right, but check it against the Bible yourself. If you take every word we or anyone else says as gospel, anyone can tell you anything and you’ll believe it! When God created the earth, He built some patterns in both the physical and spirtual worlds. That is why we can use the illustration of both with the word like fruit, trees and vines. Read Galations 5:22 over and over again, produce the fruit we were created for.